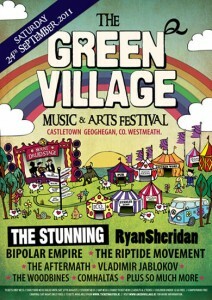 One of the most unexpected surprises in the weather occurred for the Green Village Festival 2011. A first for the quiet country village of Castletown Geoghegan which is a few minutes drive from Mullingar in Westmeath. No major festival had been held here in this manner before. Headlined by The Stunning and Ryan Sheridan the music and arts day out was blessed with a day of sunshine with cloudy spells. I think I did see some rain at around six-ish but very little. The festival had an Eco friendly feel to it with on site camping for free to festival goers. 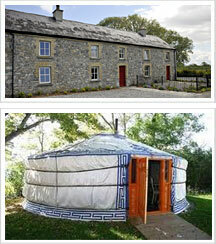 The land is also home to www.boutiquecamping.ie where you can go to camp in style in one of the yurts or bring your own gear. There is plenty of info on their web site.